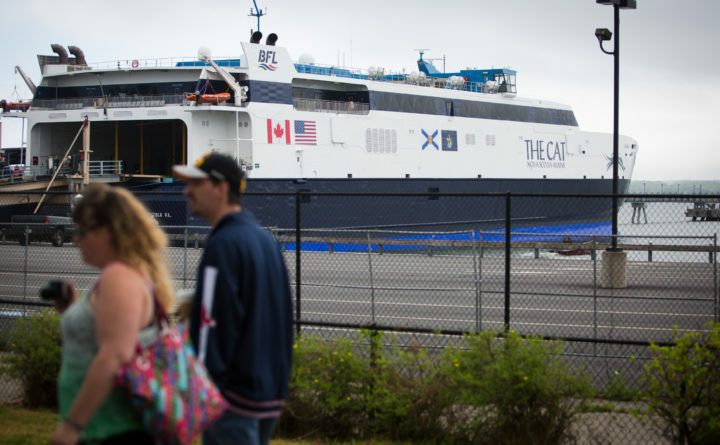 The high-speed ferry known as The Cat sits at the Ocean Gateway Terminal in Portland in a 2016 file photo. PORTLAND, Maine — The ferry between Portland and Nova Scotia carried more passengers in 2017 than it did the year before, but an engine problem put a damper on what was expected to be an even bigger spike. The Portland Press Herald reports that The Cat ferry transported more than 41,000 people from the end of May to Oct. 15, a 17 percent increase over last year. But Mark MacDonald, CEO of the company that operates the ferry, says they were expecting rides to double until an engine failure in June forced a cutback on trips. Portland received nearly $120,000 in passenger fees from the ferry from June to the end of September.